This year’s tournament was once again a great success. We had a record 107 golfers, and this year’s gifts and prizes were among the best we have had thanks to all those who sponsored and donated. The generosity was beyond words. Steve and Pam along with the TJ Memorial Fund would like to thank all of you for coming back and supporting us again this year and for all of those 1st time players, we too want to thank you and we hope you will return next year. ​Also a very special thank you to our volunteers who gave of their time so generously and do so each year. We can’t do this tournament without all of you. You are the backbone of our tournament. You hold us up and keep us strong and we thank you so very much. We also want to let those who sponsored us this year and those who gave so generously know that because of your generosity, Senior Lyndsey Richards and our incoming Junior recipient, Madison Fliedner will each receive a $5,00.000 scholarship from the TJ Myrick Memorial Endowed Scholarship at Loretto Heights School of Nursing. In addition, this year’s proceeds of $8,500.00 will be gifted into the endowment; which, when the endowment is fully funded, will provide scholarships for decades to come. And, again this year we sponsored the Caruso “200” on hole # 6. 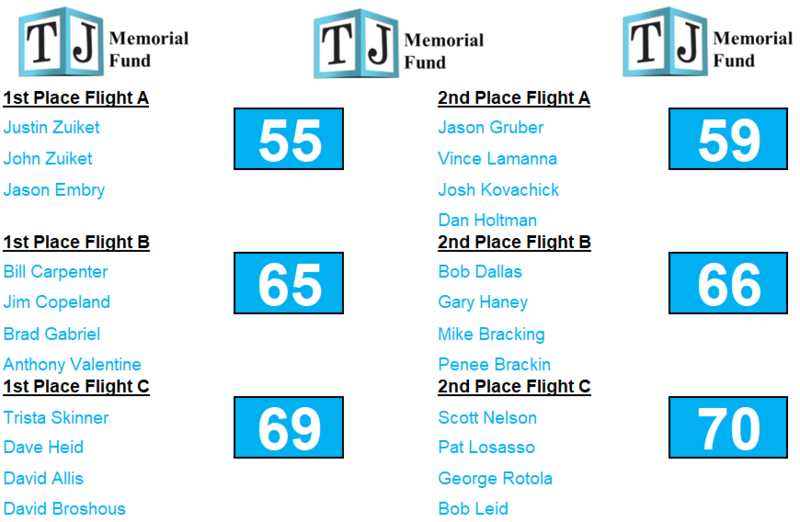 We are proud to say all our golfers participated raising $540.00 and the TJ Memorial Fund matched that; raising just over $1,000.00 for the Caruso Family Charities. Please visit the Caruso Family Charities web site at www.carusofamilycharities.org. and see all the wonderful things Jerry Caruso does for all the children and their families. He is a God send for our community. Thank You, Jerry. With all our love and gratitude; we Thank all of you.